It's hard to beat the fruit at this time of year, isn't it? Although I'm tempted by pretty much everything the market has to offer, blueberries, peaches, and nectarines are the staples that I buy every week. Usually I eat the fruit plain, but today I decided to use it in a nice summery salad. 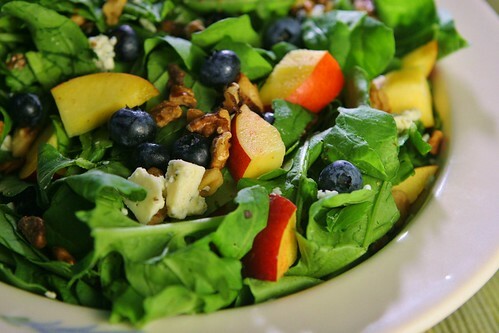 I used arugula for the base because I like how its peppery bite pairs with sweeter ingredients, and threw in a handful of blueberries. I decided to add nectarines which weren't quite ripe because I wanted them to be a bit crunchy, with a sweet-tart flavor. Blue cheese complemented the fruit perfectly, and toasted walnuts added some crunch. With its combination of sweet and savory flavors, this salad was a nice addition to our dinner and really took advantage of the gorgeous summer fruit and greens. Feel free to adjust proportions to your preference, and to substitute other fresh fruit for the berries and nectarines if you'd like. Toss all ingredients together in a salad bowl. Separate into individual portions and drizzle each bowl with olive oil and balsamic vinegar just before serving. Lovely! I really love putting seasonal fruit into savory salads - especially with some cheese and nuts. The fruit right now is just perfect for making salads a bit more interesting and fun to eat! Love this. fruit is a fabulous addition to salads these days :) really can't get enough of it!! Love all this fantastic fruit in this salad! We gotta enjoy it while it lasts!